Oh my dear blog, how I have missed you! And it's only been a few days!! There are a few blogs that I check out fairly regularly one of which is the Dancing Mermaid. The Dancing Mermaid is helping us get our creativity flowing with some daily assignments. What's crazy about this is that her timing is unreal. On January 1 I wrote about how my goal is to take my creativity with my photos to a new level. That's the day she wrote about being creative and helping others to do so. Then Sunday her assignment was to "Hang Something Pretty." That just happened to be the day I hung my pretty malas on the kitty altar. 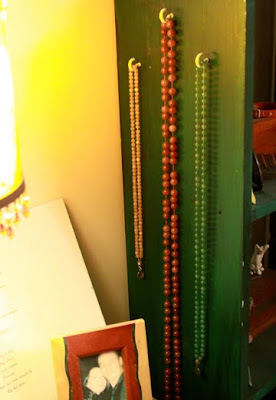 Now that idea wasn't mine, it was Shawn's but I loved it with so much gusto it kind of shocked him:) Sunday was the day he put the hooks in and I hung the malas. All of this is synchronicity, the simultaneous occurrence of events that appear significantly related but have no discernible causal connection. When synchronicity is happening we have to pay attention. It's the universe telling us something. Clearly the universe is liking my goal and sending me messages that I'm right on with it and that it's time to go with it. No more procrastinating (which by the way is my big, BIG, New Year's intention), no more excuses.